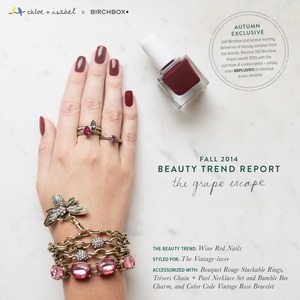 From deep wine colored nails to bright berry lips, this Fall is all about rich hues of burgundy and crimson. In the next few blog posts, I want to share with you some tips and trends to accessorize your Fall look. First up, nails. There are billions of nail colors out there, billions. And every time I get my nails done and the manicurist hands me that ring of nail colors, I totally freeze. Its like I have to make a life or death decision. Bless it all, I get so overwhelmed! Thankfully, I had flipped through the new Fall lookbook for chloe+isabel and saw the colors for fall which made it a little easier to decide on my color. I did a little research and found some of the newest collections from the top nail polish brands. Because I already spent too much time exploring the new colors for fall and getting completely carried away, I'll share the quick links for you. Hopefully, it will help you narrow down some color choices when you head in for your Fall mani/pedi! They have released two signature colors for the upcoming season, "Night Diamond" & "Sapphire Noir". Shop with my friend Janis (if you don't have a consultant yet), she will hook you up! I want to try: Both! The Nordic Collection has almost an etheral feel. Its probably their gorgeous marketing concept that sucked me in. The Wunderlust Collection is due to release this month. Did you know they have a nail club? Sign up to be a Julep Maven and receive a monthly delivery of new nail polish and beauty products. Modern Folklore has a beautiful line-up of rich and sophisticated colors. One of my annual traditions is to get a mani/pedi on the first day of school. As my kids head back to the classroom to recover their brains from summer, I celebrate by treating myself to a little pampering. Now, I need to decide which colors to try first!